Join us October 15 (a Monday, not our regular day) for the next interview in Season 9 of AIR Time presented by AIR (Arts Incubator of Richardson). 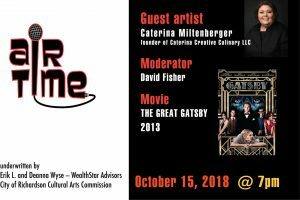 Mixologist Caterina Miltenberger, founder of Caterina Creative Culinary LLC, will share insights into the world of the cocktail…her involvement, passion, and the current trends surrounding these marvelous, and often romantic, concoctions. This evening’s movie selection is THE GREAT GATSBY (2013). Directed by Baz Luhrmann and starring Leonardo DiCaprio as Jay Gatsby, Carey Mulligan as Daisy, and Tobey Maguire as Nick Carraway, the film is an adaptation of F. Scott Fitzgerald’s classic novel, set in the lavish world of Long Island society of the 1920s. The story unfolds as Carraway sees through the weaknesses in Gatsby’s nouveau riche existence, where the ultimate madness, obsession, and tragedy await. Tickets are $5, but include a $5 food/beverage voucher.